I love listening to my online community and one question I recently got asked was what are your top tips for dealing with pain when a migraine or headache strikes and how do you stop yourself from turning to medication? 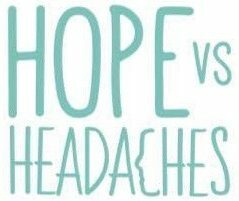 So today I am going to share exactly that in hope that some of my medication free tips and tricks can help anyone out there suffering from painful headaches and migraines. Number 1 – Meet My Best Friend, Cefaly! Cefaly is basically a form of tens machine that attaches to your forehead by an electrode pad that sends micro-impulses to stimulate the nerve endings to the trigeminal nerve. The best way I can describe it is that it massages your scalp and behind your eyes providing you relief from pain. Not just migraine pain I have to add, even after I became migraine free I used this device when I suffered from tension headaches and muscular headaches. Don’t get me wrong, it’s an investment at $349/£265, but worth every single penny. I literally don’t know how I would have survived without it. Click here to read more on Cefaly. I don’t know about you, but when a migraine attacked I used to panic. My breathing became shallow, my muscles would tense and I would become very upset. However, what I learned after many, many times of doing the opposite, the calmer I stayed and the deeper I breathed, the quicker my pain would calm and reduce. Find a comfy spot, put some relaxation music on and breathe in very slowly for ten seconds, hold for two and breathe out for ten. I know this might sound simple but fighting the pain never helped me but breathing through it did. Click here to read more about this technique. Again, it may sound simple like the breathing and a bit ‘lah de dah’ but visualising used to work for me. Pick some nice calming music, don your favourite eye mask and visualise your pain disappearing. Now don’t laugh, I used to see a team of little people enter my head with the anti-migraine cream and paint it everywhere. The painful area, previously red and inflamed, turned soft, white and back to normal, and as it did my head pain would calm. It doesn’t matter how you choose to visualise it, just see it leaving your body. Heat and ice are a great way to naturally provide you with some relief. Use what feels good to you at the time, this used to vary for me. Additionally, try burning some essential oils, pop a few drops on your pillow or dash a drop just below your nose. My favourite oils for relaxation include lavender, chamomile, rose and frankincense. Binaural beats are a form of music therapy whereby you hear two frequencies sent through headphones into each ear and as a result, the brain perceives a third tone based on the mathematical difference between the two frequencies which can reduce pain, headaches and migraines. Click here to find out more and links to helpful tracks. So how did I stop myself from taking medication? After being diagnosed with medication overuse headaches, I had to completely stop taking all painkillers. This experience was one I never want to have to repeat so every time I was faced with a headache, I always chose to go pill free as I never wanted to go through that again. Painkillers are a short-term fix but can create a long-term problem as I found out and even more headaches. All of these tips you can intertwine, and personally I think they work better combined. For example, you could practice deep breathing, with some ice behind your head, whilst donning your Cefaly with a dash of lavender on your top lip. What else has worked for you? I would love to hear. Please leave me a comment. Thats great. Good luck and let me know how you get on.